If you find yourself barnstorming your way across the country, you may lament your inability to catch up with your favorite baseball team. Fortunately, with Major League Baseball’s new MLB.TV Mobile Phone Only subscription, you’ll never be any farther away from the action than your iPhone or iPod touch. Announced on Tuesday, the Mobile Phone Only subscription is, as the name suggests, targeted at users of smartphones—in this case the iPhone (and the not-quite-smartphone iPod touch) and certain Android phones. 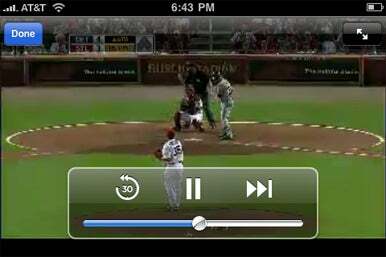 With the $50 yearly subscription and the $15 MLB.com At Bat 11 app for your device, you’ll get access to games, streamed live. The streams even come complete with a choice of home or away broadcasts, so you can enjoy your own local announcers. You’ll also get live video overlays of statistics and the scoreboard, access to full-game archives, DVR functionality that lets you pause and rewind the game even while it’s streaming live. However, access to some of the features may depend on the capabilities of your individual device. Of course, as with the MLB’s other streaming options, such as the $90 yearly MLB.TV and $110 per year MLB.TV Premium subscription, you’ll be subject to blackout restrictions for local markets. Unlike those subscriptions, you won’t get access to live games on any of your other devices, such as your Mac, PC, iPad, or Apple TV.